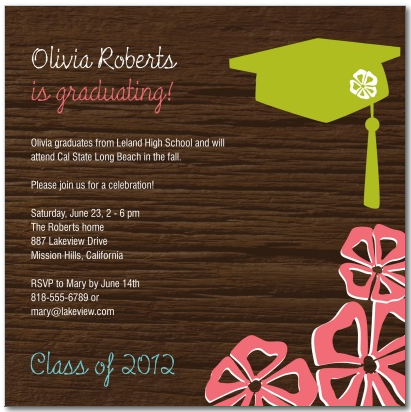 Graduation is just around the corner and now is the time to plan your grads announcements and party invitations. Whether your son or daughter is graduating from elementary school, middle school or high school, an announcement is the perfect way to spread the happy news. There are so many choices in cards these days. I love adding photos and if you pick a card with multiple photos you can do a current photo with a baby photo, cute idea! You can also find cards that match your school colors or even your party decor. This Hawaiian themed invitation from SimplytoImpress.com comes both with and without photo options (also in boy/girl versions). The Luau is always a popular party theme. And every party store carries plenty of luau party supplies year round. I love the classic black and white look and the invitation below, found here, is perfect for a more formal look. Add your son or daughters baby picture or even a sports picture, to jazz it up. School colors are always a great option. Blue and gold are very popular. The invitation below from Invitationbox.com comes in a variety of colors. Finding the card is pretty easy just make sure to do it in enough time so you are not rushing around the week before. 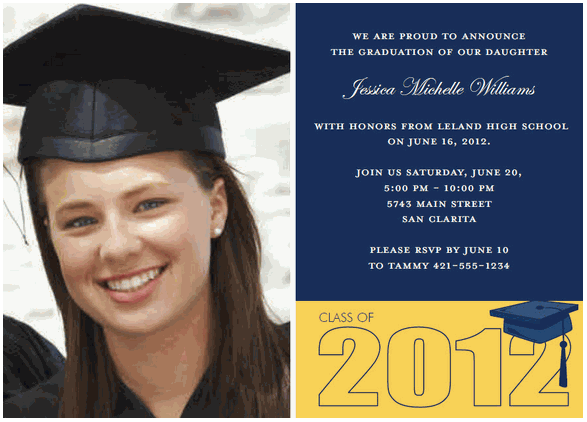 Start ordering now and enjoy a stress free and exciting day with your graduate. Here are some previous post we did on the subject that you might find useful, Photo Books and Extended Senior Photos.